A glimpse into the creative heart of todayâ&#x20AC;&#x2122;s most talented sewing & quilting artists. Saddle up, because Cathy Wiggins is rocking our quilt world by mixing leather, machine embroidery and quilting into nontraditional designs. Cathy, through tenacity and creative exploration, has found her niche and openly shares the journey with us. To Rita Farro, Cathy reveals work practices: Finding creative solutions from chatting with friends; Releasing the old to make room for the new: Honoring the life and spirit of each project. Last summer, I saw Cathy’s Rodeo in the quilt library at the International Quilt Study Center in Lincoln, NE. As the quilt was unrolled for viewing, my friends were astonished at the fine detail and even more surprised that the quilt was made of leather. I love the quote from Cathy’s Dad, because it resonates as pure truth. Cathy’s zest for leather just may inspire you to add leather to your quilting and embroidery repertoire. 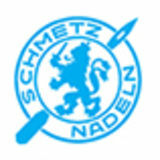 Sew SCHMETZ! Cathy Wiggins Make an entire quilt out of leather? Who would think about doing such a thing? Is it even possible? Wouldn’t it be kind of like trying to iron a shirt with a crockpot? 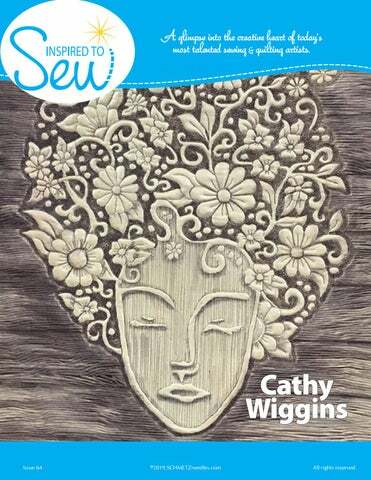 Cathy Wiggins not only figured out how to quilt on leather, but her award-winning leather quilts have gained international recognition, a book deal, and a booming new business. As a matter of fact, while on her journey to master quilting on leather, Cathy singlehandedly created a whole new genre that has rocked the quilting world. This is her story . . . .
Clowns on Parade the first of the "Just for Fun" series. use today. During those years, she painted acrylics on paper gaining recognition, winning awards, and magazine covers. It wasn’t until 2002, when she left her high tech job, that she discovered quilting. Here is Cathy’s remarkable quilt journey in her own words . . . . I started out like any other quilter, cutting little pieces and making traditional quilts. But those techniques never felt quite right with my creative spirit. I attended my first quilt show, Mid-Atlantic Quilt Festival, in 2003. I saw there were no limits to quilting, and I didn’t have to make traditional quilts. I could make pictures! And I fell in love. For the next three years, I worked hard to figure out my niche, and I bought my first longarm. I knew two things, I wanted to become a competition quilter. When people left a show after seeing 300+ quilts, I wanted them to remember mine. I began creating my "Just for Fun" series of quilts. "Clowns on Parade" was the first in the series. For this piece, I created each clown individually on it’s own background and then put them together on one large quilt top. Each clown has its own threedimensional element, like hair that sticks out or costume collars. It was like an "I spy" quilt with lots of hidden images quilted in the background. It went on to win several ribbons, and when I saw how people reacted to it, I had to make more. The next piece in the series, "Match the Bears," won my first ribbon at IQA Houston. My husband was there to see me receive my ribbon on stage. Oscar, A Dragon's Tale with a detailed view. There are 14 quilts in the series, including a pirate’s treasure map maze, a find-the-difference puzzle with knights and a dragon, and a hidden pictures image from the Highlights Magazine (used with permission, of course). Two of the most well known quilts from the series, "Witches Brew" and "Christmas Eve," were the last two quilts I made with three-dimensional elements. I then brought my painting background into my quilts and began creating quilted wholecloths. "Fairy Garden," "Sea Mates," and what I think is my best work of that series, "Carousel Stampede" are all painted, quilted and embellished. "Fairy Garden" is hand embroidered and beaded. "Carousel Stampede" has over 7000 crystals. In 2013, I began work on the last quilt in the series, "Oscar, A Dragon’s Tale." The quilt was meant to look like a book cover for Oscar the Dragon’s life story, and I wanted to find a way to simulate the traditional leather binding of old books. While vacationing with friends in New Orleans, we were discussing how to create the illusion of leather with cotton fabric. I shared my many ideas on using paints, dyes, and other surface treatments on the cotton to replicate the look. Their response was simply, "Why not use real leather?" The possibility of using actual leather in a quilt had never occurred to me! I quickly realized that trying something brand new, like quilting leather, was something I would have to figure out on my own. There were no books or classes on the subject. No YouTube videos. "If I can see it in my mind, I can create it for others to see in the real world if I believed in myself and I was willing to put in the work." The most important lesson I learned from my dad was, "If I can see it in my mind, I can create it for others to see in the real world if I believed in myself and I was willing to put in the work." So I spent the next six months researching, testing, and quilting leather. I tested thread and leather combinations and broke needles and shredded thread in the process. I experimented with different battings and backings. I applied every facet of quilting that I could think of to learn how to quilt leather. "Oscar, A Dragonâ&#x20AC;&#x2122;s Tale" made its debut in 2014 and went on to win many ribbons. Little did I know how much my life was about to change. This was the beginning of my leather journey, and it felt like I was coming home. The smell of the leather took me back to my childhood, and I wanted to create art that celebrated my early love of horses. So I created "Rodeo," my first all leather competition quilt. This quilt hit the show circuit in 2015 and ribboned at IQA Houston that year. In mid 2015, I recognized that my future was working with leather, so I made the decision to sell my cotton fabric stash. I had to clear out the old to make room for the new. But doing that meant saying good-bye to my puzzle quilts. It was the end of my "Just for Fun" series and my ego was not happy. They have been published and won lots of money and everyone loved them. How could I give them up? Rodeo with a detailed view. my first leather piece at that show to ABM Innova, and it hangs in their boardroom. In 2016, I was honored by having the Machine Quilting Expo’s New Traditions in Textiles Category renamed, "The Cathy Wiggins Award." This was followed by being named the feature artist at the 2016 Road to California, the first to live outside of California. In 2016, I was granted a solo exhibit of 17 western themed leather pieces at IQA Houston. I sold four pieces from that exhibit, including "Rodeo" to the International Quilt Studies Center and Museum in Lincoln, NE. They made the acquisition "to mark the turning point in the industry." In December of 2017, I was invited to the museum to exhibit eight of my pieces along with "Rodeo." Quilted Leather published by Schiffer Publishing. During the 2016 Houston solo exhibit, Schiffer Publishing asked "I truly love working with leathers from all of Godâ&#x20AC;&#x2122;s creatures, me to write a book on quilting leather. My book, Quilted Leather, including cows, snakes, fish, lambs, goats, pigs, buffalo, and, yes, was released in 2018. even horses. I view my work as a spiritual practice, and with each piece I create, I honor the life and soul of the creature that supplied As interest grew, so did the controversy. The two most frequently me with the material. asked questions are, "Are these real quilts?" and "How could you work with animal skins?" To answer the first question, yes, they are I have a practice for every hide that comes into my studio. When a quilts. I treat the leather just like a cotton quilt top, layering it with new hide arrives, I spread it out to view it in all its beauty. I notice backing and batting then quilting it. its perfect imperfections, touching each scar, hole, bald spot, and brand. These imperfections are what make each hide unique and As far as working with animal skins, I have created with cow, deer, beautiful. I then cleanse the hide with sage, promising to create lamb, cobra, python, reindeer, buffalo, elephant, fish, and even something beautiful in honor of the animalâ&#x20AC;&#x2122;s life and spirit. With horse. This quote from my book best expresses my feelings: each hide, I feel as if I release a spirit to add to the magic and energy I feel each time I step into my studio." Bentley with his saddle. 2018 International Quilt Festival, Houston TX. dad taught me, "If I can see it in my mind, I can create it for others to see in the real world if I believed in myself and I was willing to put in the work." I made Bentley a saddle out of quilted leather. I developed a process called, "thread tooling" where I used quilting and dyes to create the illusion of traditional tooled leather. After making Bentley’s saddle, I decided to make a full-sized traditional western saddle. Once that was complete, I decided to make a red one with Swarovski crystals. In February of 2018, I was invited back to IQA Houston for another solo exhibit of 10 quilted saddles, plus Bentley’s and his little sister Mercedes. Grace Cathy's most popular leather designs are available in kits. For 2019, my focus is on building Gypsy Wood Leathers. I have no idea how to build a business, but once again I fall back on the lesson from my father. We will continue to grow our project kit offerings with wall art, handbags, garment panels and even a tuffet. To introduce Gypsy Wood Leathers to the wholesale market, we will attend Fall Quilt Market to offer quilt shop owners a whole new line of products for their customers. We realize creating with leather is new, different, and scary, and there is a lot to learn. Bringing leather into a shop is like bringing in a new machine, you can’t sell it if you don’t know how to use it. To help with education, we’ve developed "Boot Camp in a Box." The Gypsy Wood Leathers Boot Camp teaches shop owners how to make a purse, journal cover, two wall hangings, and a panel that can be used in a garment. Each project can be a class, using either free-motion quilting on a domestic or longarm machine or embroidery. We will also be announcing our first block of the month at fall market. In addition, we’ve introduced the Teach the Teacher program to develop Gypsy Wood Leathers certified instructors to help with the growing demand for classes. Our long-term goal is to open brick and mortar shops where we would sell our products, offer classes, and have a gallery space for displaying finished leather art. It can be difficult to balance building a business and fueling the artist within. I could not do it without the support of my family. My husband has been my rock. I would not have had the courage to take this leap without him behind me every step of the way. My daughter, Olivia, handles much of the day-to-day operations of the business, including shipping orders, creating kits, preparing and manning our booth for trade shows, which frees me up to focus on the creative. It is not easy to follow your dreams. It takes hard work and passion for what you are doing, but it’s never too late. I turned 58 in January and I had a choice. I could decide I’m too old to start a business. Or, I could spend the rest of my life living my passion and going after my dream of building a business that inspires others to create. That choice was easy. When quilting leather on your home sewing machine, it is important to use a SCHMETZ Leather needle. The Leather needle has a knife point that cuts a clean hole. Size 90/14 is the perfect size for most threads. The needle is a little larger, it cuts a bigger hole which prevents the thread from shredding, while still small enough allowing intricate quilting designs without perforating the leather.